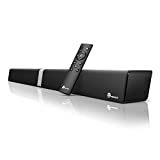 Two weeks ago we told you about a killer sale on a best-selling sound bar on Amazon that dropped the price to just $90. That’s right, $90 for a terrific sound bar that will upgrade the audio on any TV. Well, it flew off of Amazon’s virtual store shelves immediately after we wrote about it. In fact, it was the most popular product we covered that week. Guess what: it’s back! Amazon has once again dropped the price of the TaoTronics Sound Bar to just $89.99 while supplies last. And trust us, supplies won’t last.